Paying tribute to the first Anzacs and the servicemen and women who have since followed in their footsteps. AUSTINMER 5.45am Austinmer/Thirroul RSL Sub-Branch. March from car park adjacent to Austinmer Surf Club to Austinmer War Memorial. Breakfast at Thirroul Bowling Club 5.45am, service at 6am. CORRIMAL 5.30am Corrimal RSL Dawn Service. 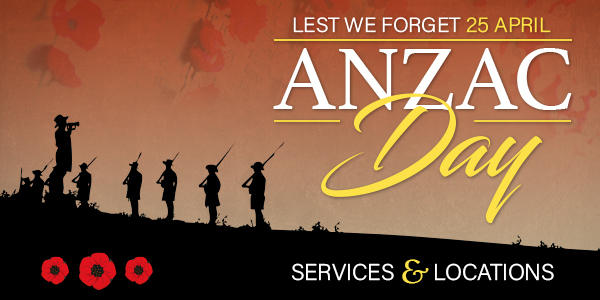 March from Corrimal RSL to the Memorial at Anzac Grove off Railway Street for service and return to RSL. Muster starts 5.30am, March at 5.45am Service at 6am. DAPTO 6.00am Dapto RSL Club. Dawn Service at Memorial at Dapto Railway Station 6am. DAPTO before 12.00pm Dapto Citizens Bowling Club. Service at Bowling Club prior to commencement of bowls 12noon. PORT KEMBLA 6.00am Port Kembla RSL Club. STANWELL TOPS 10.00am Service at Stanwell Tops Memorial Park followed by refreshments 10am service Lions Club of Helensburgh. SYDNEY METRO 9.00am 2019 Anzac Day March. Paying tribute to the first Anzacs and the servicemen and women who have since followed in their footsteps. THIRROUL 5.45am Austinmer/Thirroul RSL Sub-Branch. Dawn Service at William Woodward Park, Thirroul. Breakfast at Thirroul Bowling Club 5.45am, service at 6am. WINDANG 7.45am Parade commences from Lake Illawarra Hotel carpark to Club Windang for service 7.45am parade followed by service at Club Windang. Wollongong Cenotaph, McCabe Park (march forming outside City Diggers to Cenotaph). 4.45am for 5am service Wollongong RSL Sub Branch. WOLLONGONG 11.00am Wollongong Anzac Day City March. March commences lower Crown Street Mall turning right into Kembla Street, right into Burelli Street, left into Church Street, pass the Cenotaph in McCabe Park, and dispersing into MacCabe Park after Pioneer Hall. WOONONA 5.45am Woonona-Bulli RSL Club. March from IGA car park at Woonona to the cenotaph at Woonona-Bulli RSL Club. 5.45am for service 6am Woonona Bulli RSL Club. SHELLHARBOUR CITY 7.35am Join us at the Shellharbour City Memorial, Harrison Park at 7.35am for a combined service hosted by Warilla & Albion Park RSL sub-branches. To mark the Centenary of ANZAC, the Historical Aircraft Restoration Society (HARS) will honour our servicemen & women with a flyover during the service. Members of the Warilla and Albion Park RSL Sub-branches will be in attendence.